Brief Description The best way to see this beautiful and historic city. Description See one of the most beautiful and historic cities in America on a Segway PT. Enjoy the breathtaking scenery with unobstructed and up-close-and-personal views while learning some of the history of one of the country's most historically significant cities. We offer 60-minute and 90-minute tours of Historic Savannah and a 90-minute tour of the famous Bonaventure Cemetery and 60-minute tours of our undiscovered cemetery, Laurel Grove. 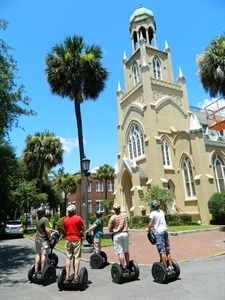 Add Segway of Savannah to your free online travel itinerary.